Hong Kong, January 14, 2015 – QIMA, a leading global quality control and compliance service provider that partners with brands, retailers and importers around the world to secure, manage and optimize their supply chain, today announces its 2015 Q1 Barometer, a quarterly synopsis on outsourced manufacturing and the quality control services industry. Looking back at 2014, QIMA's data reveals some interesting trends in manufacturing output quality in Asia (measured by the Acceptable Quality Level results of onsite inspections) for four major sourcing regions in Asia. 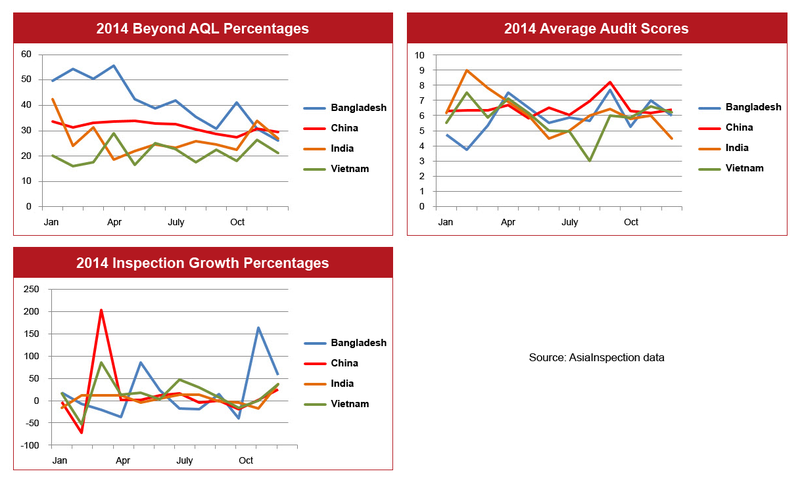 Notably, AQL inspection results in Bangladesh have gradually improved throughout the year, from an initial high of over 50% Beyond AQL inspections to just above 25% in December. It is likely due to the enormous pressure being applied on brands to demonstrate ethically compliant supply chains in Bangladesh following incidents such as Rana Plaza in 2013, causing buyers to more carefully select suppliers and push them to improve standards. On the food front, data from AsiaFoodInspection, QIMA's food inspection arm, shows that 48.1% of inspections in China failed in 2014. China is struggling with low consumer confidence in food safety as the country was hit with multiple scandals. Most notably, the closure of Shanghai Husi Food Co. by authorities after it was discovered to be supplying expired meat to global brands such as Yum! and McDonalds. "These aren’t just numbers on a page, QIMA auditors continue to discover child laborers in factories. There’s a disbelief that child labor can still exist in 2015, but this is real. Tackling the issue is no easy task for brands and retailers in supply chains that are increasingly complex and fragmented, but action can be taken to safeguard these children’s childhoods," said Sebastien Breteau, QIMA CEO. The past year also saw unrest regarding working conditions in Asia. QIMA's 2014 figures show that Health & Safety is consistently the main reason for failure of ethical audits, with India scoring the worst, at an average of 3.8/10. Bangladesh and China’s factories scored 4.2 and 4.4, respectively. Working Hours and Compensation are the second most common cause of failure in QIMA's ethical audits. Here again, India scores an average of 3.9/10, worse than China at 5.3 and Bangladesh at 6.2. While 2014 did not have any major disasters involving the loss of human life on the scale of Rana Plaza, it is evident that despite the work done to raise awareness of ethical compliance, global supply chains still suffer from widespread labor abuses. QIMA's data shows that 50% of factories audited by QIMA in India and 43% in Bangladesh were found to have one or more Major Non-Compliance for Health & Safety in 2014. Transparency and analytics will be key topics in 2015. Sedex Global published a briefing in September highlighting the risks of corruption and how it exacerbates supply chains issues, and methods to combat the risk.8 Key among those are audit programs mated to business intelligence systems such as those developed by AI, which allow real-time oversight of suppliers. The Deloitte Global CPO Survey 2014 reveals that 65% of CPO’s are investing in supplier portals, and 67% list quality of data as a barrier to the use of effective analytics, and 40% cite lack of integration.9 These systems will be an essential tool in 2015 for understanding supply chains. Geographically, changes in global manufacturing cost-competitiveness will likely cause buyers to take advantage of lower costs and proximity to consumer markets in countries such as Mexico. China’s estimated cost advantage over the US is now less than 5% as the country transitions to increasingly value-added production with higher labor costs.10 This also allows developing Asian countries such as India and Indonesia, whose costs have risen at a comparatively lower rate, to capture manufacturing volume in apparel and other goods as buyers develop China +1 sourcing strategies. QIMA is a leading quality control service provider that partners with international Brands, Retailers and Importers to secure and manage their global supply chain. With unique web-based quality control management, QIMA offers Product Inspection, Factory Audit and Laboratory Testing services for more than 4,000 clients worldwide. 1. US Dept. of Labor, Bureau of International Labor Affairs. 2013 Findings on the Worst Forms of Child Labor. October 7th 2014. 2. Walk Free Foundation. 2014 Global Slavery Index. November 17th 2014. 3. International Labour Organisation. Employment Practices and Working Conditions in Thailand’s Fishing Sector. Accessed December 17th 2014. 4. Accord on Fire and Building Safety in Bangladesh. Accord Reached Important Milestone by Completing Initial Inspections of Factories in Bangladesh. October 14th 2014. 5. International Labour Organisation. Despite Some Progress, Garment Factories Need to Strengthen Fire Safety. December 11th 2014. 6. Associated Press. Cambodia Increases Garment Industry Minimum Wage. November 12th 2014. 7. Cambodia Daily. Unions Claim Garment Factory Fired 1,200 Workers for Strike. December 10th 2014. 8. Sedex. New Sedex Briefing Highlights Need for Global Response to Corruption. December 11th 2014. 9. Deloitte. The Deloitte Global CPO Survey 2014. December 2014. 10. Boston Consulting Group. The Shifting Economics of Global Manufacturing. August 19th 2014.